Choose a job you love, and you will never have to work a day in your life. For all of the pros that go with it, there are some cons–just like everything in life. Balance. I’m working on fitting that into my world. How do you balance working from home with your personal life? It’s quite a challenge. I find myself busier now than when I worked in a doctor’s office 4-5 days a week. My plan when I first became a WAHM was to do all my housework/business/writing stuff during the day Monday through Friday. This would allow me to relax and unwind on weeknights and the weekend. Relax and unwind=watch movies, spend time with The Deuce and Hubby, work on my scrapbooks, read, and even make plans for the next time I work. Well I have talked before about how my plans usually turn out. Regardless, I know there’s a way to do both. And be successful at it. I’m on a mission to discover that. I don’t want to worry about whether the way I make money is interfering with quality family time. Or vice versa. I don’t want either to suffer. That can be a distraction as well. I have faith that I’ll find the answer. Nothing in this world worth fighting for comes easy. 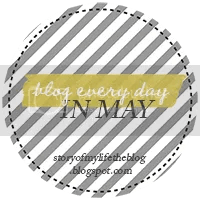 This post is for Day 20 of the Blog Every Day In May Challenge: Get real. Share something you’re struggling with right now.